When I saw this new release (1/2010) from Harvest House Publishers, A Warrior Prince for God , I had to track it down. Billed as dealing with fear and talking about courage, I knew it was for us. We've been talking a lot about being courageous around here, and not giving into fear when we come up against things that might give us the willies. Bookworm1 isn't scared of very much and then we're very aware of what he is exposed to and when. We want to protect his heart and his mind, introducing him to things at a pace which is suitable to his maturity level. We want to be certain that we're taking age-appropriate steps to bring him to an understanding of what the world around him is like and what issues one must face in life. We answer his questions when he asks them and we let him be all of glorious THREE for the time being! One of the things we've been doing to this end is memorizing and repeating a lot scripture, trying to meet the issue of fear head on. * When we meet people we don't know very well. In A Warrior Prince for God we meet young Luke, who is a part of the Warriors baseball team. But, as his coach says, they aren't just a team called the Warriors - they really ARE mighty warriors for God. A Warrior Prince for God is probably a little Pilgrim's Progress, rolled into a little bit of Narnia, throwing in a mention of David and Goliath with plenty of analogies to be made between Drakon on the serpant in the Garden of Eden. Bookworm1 loves it and I'm pleased with it also. He has requested multiple re-reads of the "battle against the snake." The message of the book is clear and strong: we can be courageous and stand strong in the Lord and need not give in to fear. The crux of the issue (for me) is this: we can walk in God-confidence even from a young age, not allowing our imaginations to trick us and not to run away from things that might look scary on the surface, but upon further inspection turn out to be mere shadows on the wall. God does not give us a Spirit of fear, after all, but of power, love and a strong mind (2 Tim. 1:7). To that end, I have nothing but nice things to say about A Warrior Prince for God as it upholds this message of truth. It is an action/adventure story sure to please young men-in-training. I appreciate it very much. 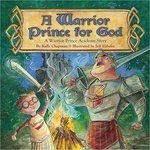 If you like the concept, you'll be happy to note that there is a A Warrior Prince for God Activity Book set to be released in May, 2010. Thanks, Harvest House, for giving us the opportunity to check out this great resource! I'll have to keep this mind! I'm a very fearful person and I have been from a child. My husband, on the other hand, isn't afraid of anything and never really has been. I really hope that our children take after him because having to constantly deal with fear in my life is a huge handicap. Sounds like a fantastic book! I have one little guy who is so introverted and shy that he's afraid of everything. I'll have to keep an eye out for this book. "a little Pilgrim's Progress, rolled into a little bit of Narnia, throwing in a mention of David and Goliath"
All favorite adventures that my savages like to read over and over! Sounds like a wonderful book. I will definitely keep it in mind as my little guy starts to read!